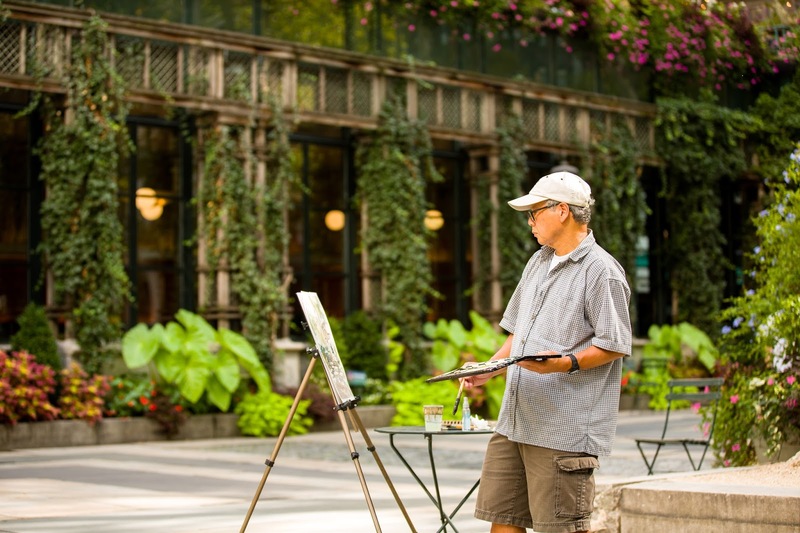 Bryant Park Blog: Are You Bryant Park's Next Painter in Residence? Are You Bryant Park's Next Painter in Residence? Are you Bryant Park's next Painter in Residence? If you're a visual artist who loves Bryant Park and plein air painting, you should consider applying for this park residency, now in its fourth year. The program invites four painters to create representations of Bryant Park's landscapes and iconic features for two weeks at a time. At the end of each painter's stint in the park, the pieces are added to Bryant Park's permanent collection of art. Applications close on May 31; the awards will be announced on June 15. Click through to the application for more information. David Lee, one of last year's Painters in Residence, works on the Upper Terrace.